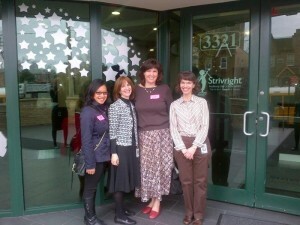 I recently visited the Strivright Auditory Oral School of New York. The school was founded by Pnina Bravmann, CCC-SLP/A. Pnina Bravmann is an inspired and inspiring director and visionary for the auditory oral approach. What you hear in this school are the voices of children and the teachers talking, learning, singing, and listening. Michele Bornfeld, CCC-SLP, and the teachers, SLPs, OTs, PTs, teaching assistants, music, art, and literacy teachers (yes!) implement exemplary curriculum and strategies to develop the auditory and oral skills of the lucky children who attend. The school begins with early intervention and goes through preschool. There are many integrated classes. They think about the future and have a well-established collaboration with NYCDOE. Although all I did was visit, in watching the quality of the work done there, I felt proud of my profession.